If you’ve spent any time in London lately, you’ve probably noticed that there’s something happening with the restaurant scene over there. Call it a rebirth, call it gentrification, or call it Brooklynization (actually, don’t call it that), but there is definitely a new crop of interesting, youthful, excellent restaurants popping up around that city. A city, mind you, whose most significant recent contributions to the U.S. food scene have been Gordon Ramsay and allowing Kate Middleton to be seen at a McDonald's once. Thanks, England. Let it be known that The Clocktower is the sign of times changing. 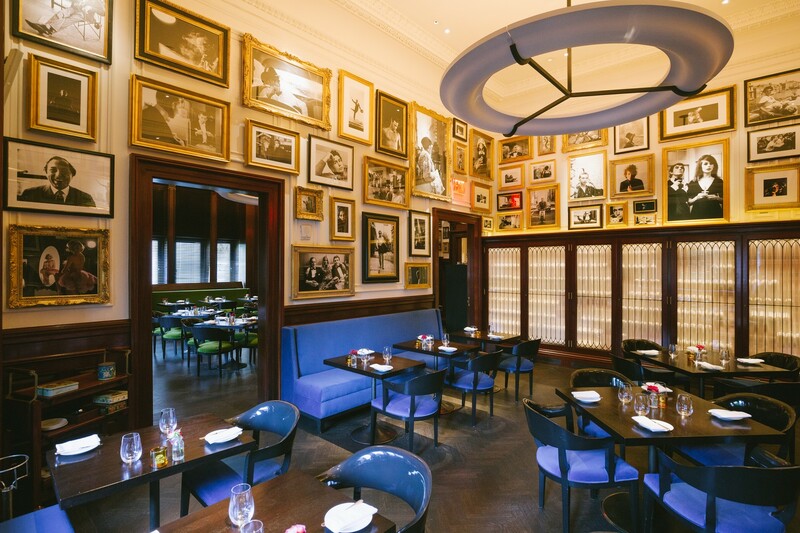 This restaurant on the second floor of the Edition Hotel on Madison Square Park is a near exact facsimile of Berners Tavern, an excellent and very popular establishment inside the London Edition. It’s not a true import - both The Clocktower and Berners are run by the same chef, but our American version is backed by Stephen Starr to make sure it translates from British to American. Like Steve Carell. And translate it does. The menu at The Clocktower can best be described as “vaguely” English, in that you’ll find things like Dover sole and pigeon pie intermingled with skirt steak and halibut and mac 'n cheese, which in reality is probably the truest expression of American dining that you can find. What’s more American than a little bit of everything? A lot of everything. And there’s a lot of incredibly good food here. Beyond what there is to eat, there is also a lot to see in this restaurant. The space takes up the entire second floor of the building, and is comprised of several rooms decorated wall-to-wall with classic photographs of musicians, actors, and artists. There’s even a purple pool table, just to make sure you know the place is pretttty chill. Ultimately though, the good vibes in the room come less from the props and more from the excellent and professional service. This is not just another hotel restaurant. This is a restaurant on par with some of the best in this town. So now that it’s been proven that a London restaurant can work in New York, what do we gotta do to get some real Cadbury Crunchie bars up in here? We’ll give you all of Gordon Ramsay’s remaining restaurants back in return. Behold. This is what buckets used to look like in the olden days. Carved from a single piece of oak and lined with platinum. Our forefathers had it good. We actually love the presentation on these bivalves, a pleasant departure from your typical metal tray suspended in air. The oysters? On our visits they were fantastic. Only available at lunch and brunch, which means you’re going to need to make plans to hit The Clocktower while the sun is up if you want to get your hands on this $24 burger. Probably also make plans to hit the piggy bank before hand. Not your average skirt steak, which is to say, not covered in spices and jammed into a tortilla or something. This steak holds up to any on the menu and would be our recommendation over the filet or the strip. Save a few bucks for another half a drink. Native lobster? Native to what? This hotel? Does it have rich French parents? It doesn’t matter, it’s delicious. Served cold, this dish is essentially a lobster salad, full of fennel, apple, and even some mussels. Crab salad, in its shell, with apple batons (a better word than “sticks”) and crispy uni (no better word for that). They say this glorious apple pie creation is made for two. Sounds like a challenge. And we’re betting you’re not the type to back away from a challenge.